Project Description: One of the major pump stations serving the Netarts Oceanside Sanitary District was relatively old and the mechanical systems were in poor condition. As a result, raw sewage overflows directly into Netarts Bay were routinely occurring. Netarts Bay is a popular area for recreation and shellfish harvest. As such, these raw sewage overflows were simply unacceptable. To correct this problem Westech assisted the District with planning, design, construction administration & commissioning for the reconstruction of the station. The improvements included constructing a completely new station with tandem duplex pumping configuration, auxiliary power system, force main and site improvements, a new control/generator building, electrical and telemetry systems, and a chemical feed system for hydrogen sulfide control. 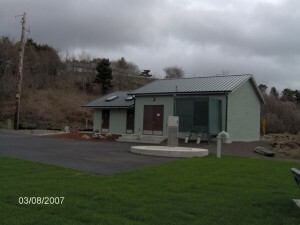 The pump station is located immediately adjacent to the Netarts Bay harbor. Key design considerations included extremely high static head, which necessitated use of tandem duplex pumps. Each set of pumps consists of one submersible pump in the wetwell and one drypit pump in the pump & control building. The Netarts Pump Station was designed to pump sewage over the hill between Netarts and Oceanside. The project included a new 10” force main (±8200 feet long), including one ±370 foot segment installed under a slide area by directional drilling. The Netarts Pump Station was constructed on land owned by Tillamook County Parks and managed by Oregon State Parks. The project also included the design of a new County Parks restroom facility which was integrated into the pump station building.